The scheme, which launched in January 2014, teamed up with level three graphic design students to create special artwork which could be used to promote the campaign across the borough. As part of its goal to raise awareness of adoption as an option, the Let’s Adopt team called on the public during last November’s National Adoption Week. During this time, the adoption service team encouraged members of the public to pledge prints of their hands, with over 1,000 being collected. 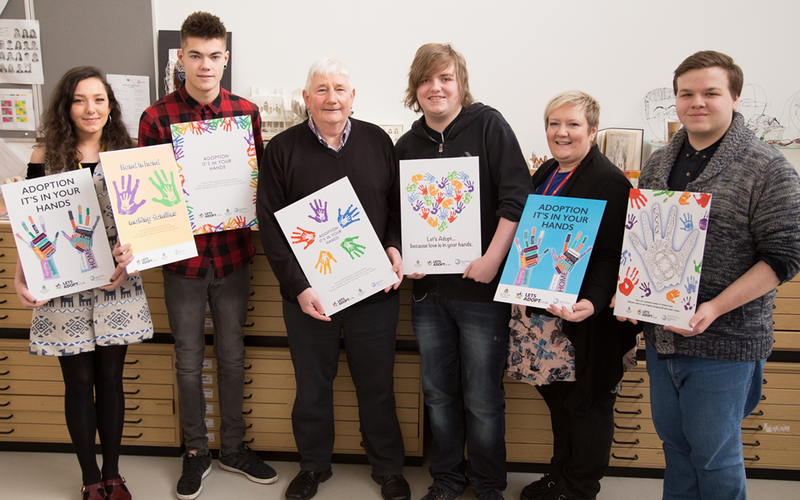 Blackburn College students then went head-to-head to come up with innovative designs that incorporated the handprints, which captured the campaign’s key messages. And now, 19-year-old Louis Birtwistle has been crowned winner and was awarded a £50 voucher, while his classmates Christopher Carter, Sam West and Rianna Rumball were named as runners-up. Louis Birtwistle, Blackburn College student and overall competition winner, said: “I wasn’t expecting to win, but I am really happy that the judges liked my creation. I chose my design because I felt that if you are going to adopt, you need to give a lot of love. “I was extremely impressed with the students’ designs and how they interpreted their brief; it was interesting to see how many different ways the handprints were used. As part of their prize, the winner and runners-up will have their artwork used on bus shelters throughout the borough, while all those who took part in the competition will display their designs at a special showcase evening at the college in June. “The students really enjoyed working on this ‘live’ brief. It’s a great way for them to develop their employability skills and is a nice departure from their existing course work. “The project has provided the students with the chance to showcase their skills, as well as working on developing ideas to promote such a worthwhile cause. Since its launch, Let’s Adopt has taken 85 serious enquiries from potential adopters and has helped to bust common myths surrounding the adoption process. “The Let’s Adopt campaign has given us a huge boost in the number of potential adopters coming forward to find out more. Find out more about Let’s Adopt.